Space systems operations specialists are tasked with overseeing critical aspects of the Air Force's space program, including tracking satellites and ballistic missiles, monitoring space flight operations, and assisting with rocket launches. The Air Force categorizes this important job with Air Force Specialty Code (AFSC) 1C6X1. These airmen detect, identify, and maintain surveillance on low orbiting and deep space satellite vehicles using active and passive space surveillance systems. Part of their work involves exploring new space surveillance technologies, developing new space operational procedures, and employing new space surveillance sensors. They also use sophisticated Air Force tracking technology to detect and track sea-launched and intercontinental ballistic missiles, and detect and track Earth satellites. In addition, these specialists plan satellite contacts, resolve any emergencies that arise with satellites, and conduct satellite commanding during launch, early orbit, daily operations, and end-of-life testing, when the satellites have outlived their use. 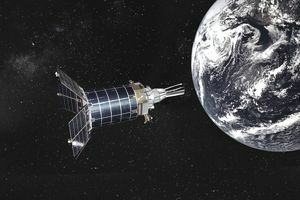 The satellites they operate include Navstar Global Positioning System (GPS) satellites used for military communications. And they assist with launch operations for other Department of Defense and NASA satellites. To be eligible to serve as a space systems operations specialist, you need a score of at least 60 on the electronics (E) qualification aptitude area of the Armed Services Vocational Aptitude Battery (ASVAB) tests. For entry into this specialty, completion of high school with courses in physics, geometry, trigonometry, algebra and computer science will be helpful. And you'll need to complete a basic space systems operator course. Since you'll be dealing with highly sensitive information in the course of your daily job, you will also need to qualify for a secret security clearance from the Department of Defense. This involves background checks of your character and finances, and a criminal record of history of drug abuse may be disqualifying. Candidates for this job must be U.S. citizens. Since this Air Force job primarily deals with military satellites and other systems, there is no true civilian job that could be considered equivalent. However, the skills you learn should lay the groundwork for a number of careers in technology hardware and may qualify you for jobs in the aerospace industry or with a defense contractor.